The NHS in England is to review how much it pays male and female doctors in an effort to eliminate a gender pay gap of 15%. A review announced by the health secretary will look at why male doctors are paid on average £10,000 more than female doctors, as the BBC reported. Across the whole NHS, women are paid 23% less than men despite far more women being employed. A leading female doctor is to lead the review into the reasons behind the gap. Prof Jane Dacre, president of the Royal College of Physicians, will lead the independent review into gender pay inequality. Speaking on Radio 4's Today programme, she said women made "brilliant doctors" and had "contributed hugely to the health service", and the review would look to "sort out a level of inequality that's been going on for many years". She added that as more than 50% of medical school entrants were women, the problem "needs to be fixed". Male doctors are paid on average £67,788 in basic pay, compared with £57,569 for female doctors. Prof Dacre said the review would look at why some women's career trajectories might be slower than their male counterparts, adding "societal expectations on women" mean they are more likely to take time out to care for children, or relatives. Jeremy Hunt, the health and social care secretary in England, said it was unacceptable that staff still faced gender inequality and he was "determined" to eliminate the pay gap. The pay gap exists because there are more higher-paid male doctors than female doctors in senior positions, although women make up more than half of junior doctors. Taking time out to have children can affect pay progression, particularly for female consultants. They are also much less likely to given reward payments for work done over-and-above their core roles. 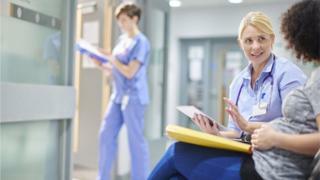 Dr Anthea Mowat, from the British Medical Association, said women still faced all kinds of barriers in their careers and she hoped the review would lead to policy changes. "We know that the gender pay gap in medicine is heavily linked to part-time working, an unequal share of childcare responsibilities as well as bias and discrimination which still exists in the profession." The review, which should finish by the end of 2018, is expected to have wider implications for the rest of the NHS and other staff groups.